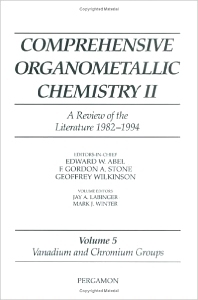 In addition to providing an updated survey of organometallic compounds of the group 5 elements, these chapters highlight developments in their utilization, most of which have taken place since COMC. Some of the important topics featured include the antitumor activity of vanadocene derivatives; uses in organic synthesis; and a wide variety of catalytic applications, such as the role of group 5 alkylidene complexes in alkene metathesis and ring-opening metathesis polymerization. Vanadium (S. Gambarotta). Niobium and Tantalum (D.E. Wigley). Hexacarbonyls and Carbonyl Complexes of Carbon &sgr;-bonded Ligands of Chromium, Molybdenum and Tungsten (M.J. Winter). Carbonyl Complexes of Noncarbon &sgr;-bonded Ligands of Chronium, Molybdenum and Tungsten (S. Woodward). Organometallic Complexes of Chromium, Molybdenum and Tungsten without Carbonyl Ligands (S. Woodward, M.J. Winter). &pgr;-complexes of Chromium, Molybdenum and Tungsten, Excluding those of Cyclopentadienyls and Arenes (M.T. Whiteley). Cyclopentadienyl Complexes of Chromium, Molybdenum and Tungsten (M.J. Morris). Arene and Heteroarene Complexes of Chromium Molybdenum, and Tungsten (M.J. Morris).